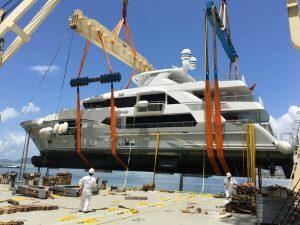 Check out this latest IAG yachts build by Atlantic Yacht & Ship! : Atlantic Yacht & Ship, Inc. Check out this latest IAG yachts build by Atlantic Yacht & Ship! Word just came in from Doug Hoogs regarding the latest IAG Yachts build of the 133′ IAG known as “Serenity” soon to be delievered! “Serenity” is a Custom 133′ foot yacht with unique fixed balconies on two separate decks. This yacht has been built in China by IAG Yachts for a Mid-Western businessman. The buyer was brought to IAG by Doug Hoogs of Atlantic Yacht and Ship. Serenity will be in transit from Hong Kong on a Sevenstar ship for the next 30 days and will arrive in Ft. Lauderdale around September 8th. This IAG Yachts build has exterior styling and interior design completely by Evan K. Marshall Design. Axis Yacht Design performed all of the Naval Architecture. The owner has been very involved in the design and the build process. He intends to base the yacht in South Florida for private use. However, she will be available for exclusive charter to the Bahamas. For more information on this 133′ IAG Yachts build be sure to contact us at Atlantic Yacht & Ship today! New Yacht build opportunity with IAG Yachts!